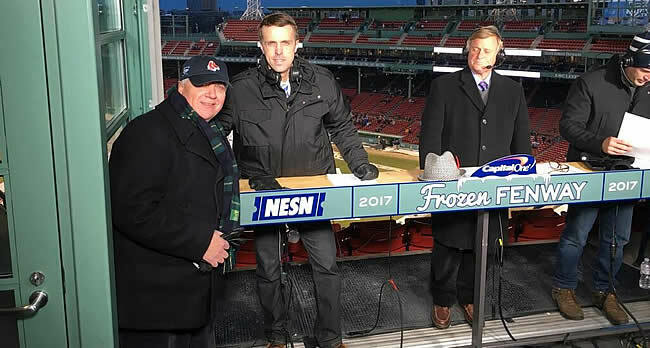 Spring Monday Nights, Mid-April thru Mid-June 7:10-8:30 p.m.
Former Boston Bruins goalie coach and current Hockey East Commissioner Joe Bertagna being interviewed by Bertagna Staffer Mike Morrison and former UMass head coach Don "Toot" Cahoon at Frozen Fenway on NESN. Order instructional DVDs from Joe Bertagna! 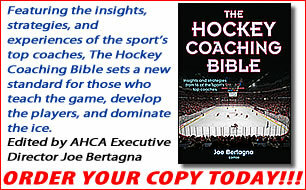 Former Boston Bruins goalie coach Joe Bertagna has completed his fourth DVD for Championship Productions of Ames, IA. This one is titled, "Goaltending Today: Traditional Values through New Techniques." 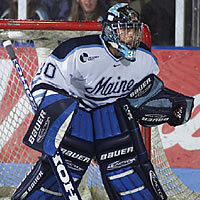 Filmed this summer with former NHL netminder Mike Morrison, and enhanced this winter with UMass goalie coach Mike Buckley, this DVD shows how many of the newer techniques employed by today's top goalies are used to reach familiar goals of proper positioning and puck control. Click here for more information and to download an order form!! We have seen quite a few changes in the instruction we have offered for almost four decades. At first, we only coached goalies and our goalie clinics are still what occupies our staff the most. But even the goalie instruction has changed. Families are not content with limiting their instruction to a single week in the summer. They want help all year round. They might want to attend once a week instead of five straight days. With costs and busy family schedules, they might want a shorter clinic. And they want personalized attention. And so we have adapted to give familes what they want. We also have worked to stay "current." With the addition of younger staff, recently out of college or professional hockey, we have made sure to stay up with changes in the game. Joe and his staff are available year-round for youth hockey organizations. We now offer a variety of summer sessions, Three-day, four-day and five-day options are available, as is a once-a-week option. We are also busier in the fall and winter than ever before. And each spring, we offer instruction for adult women hockey players (not just goalies) as interest in women's hockey has really taken off. We hope you consider one of the many options we offer, all of which are designed to help you play better and enjoy the game more. The fact that we are in our 38th year is living testimony to what thousands of hockey players have enjoyed by coming to us for instruction. Joe or a staff member will attend and observe a game and write up a detailed analysis of what you have to work on. To arrange for this service, contact Joe at jbertagna@comcast.net.